Description A tall man with an imposing physique. Although born in the western lands, he was deeply affected by the culture of the East which led him to travel alone to the country of San and undergo training in swordsmanship before finally emerging as a full-fledged Samurai. His rugged appearance at first glance belies a middle-aged man with a wide range of emotions and an easy-going nature. His personality makes it highly unlikely he'll reach for his sword in anger, but once his Katana is drawn he changes into a fearsome swordsman with a sharp killing intent. A tall man with an imposing physique. Although born in the western lands, he was deeply affected by the culture of the East which led him to travel alone to the country of San and undergo training in swordsmanship before finally emerging as a full-fledged Samurai. His rugged appearance at first glance belies a middle-aged man with a wide range of emotions and an easy-going nature. His personality makes it highly unlikely he'll reach for his sword in anger, but once his Katana is drawn he changes into a fearsome swordsman with a sharp killing intent. [Spoiler] Edgar and Lusit meet Kanbe when the latter accidentally blunders into the territory of local ruffians and has to fight his way out. As he has run out of funds on his itinerant journey, he chooses to join the guild in return for bed and board. Born in a kingdom not far from Dantor, he lost his wife and son for reasons unexplained. 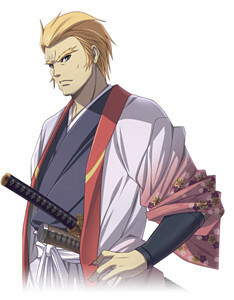 Running away from his past, he made his way to the country of San to train as a Samurai. After completing his training, he travels the realms promoting his own form of Bushido: one which prioritises the welfare of children above even his own life. Although he likes wine and women, he does not make any advances on the female guild members to avoid unnecessary conflict. A tall man with an imposing physique. Although born in the western lands, he was deeply affected by the culture of the East which led him to travel alone to the country of San and undergo training in swordsmanship before finally emerging as a full-fledged Samurai. <hidden by spoiler settings> Edgar and Lusit meet Kanbe when the latter accidentally blunders into the territory of local ruffians and has to fight his way out. As he has run out of funds on his itinerant journey, he chooses to join the guild in return for bed and board. Kanbe eventually starts his own Dojo in Dantor. Despite his denials, he eventually becomes an item with the first disciple to join him. This in turn makes him fearful of Lusit whenever they meet up.